Dutch ovens are cylindrical, heavy gauge cooking pots with tight-fitting lids that can be used either on a range top or in the oven. The heavy metal or ceramic construction provides constant, even and multi-directional radiant heat to the food being cooked inside. The term “Dutch oven” is something of a misnomer in that the pots are neither Dutch nor actual ovens. Rather, it refers to the casting process developed in Holland by which brass vessels were cast in dry-sand molds. In 1704, an Englishman by the name of Abraham Darby traveled to the Netherlands to observe how the thick-walled cast-iron pots were made and, eventually, patented a similar process for use in England and its American colonies. A Dutch oven has the advantage of using one pot from start to finish — you can sear protein in the same pan you use to braise. When using a Dutch oven, you can braise on the stove top or in the oven. 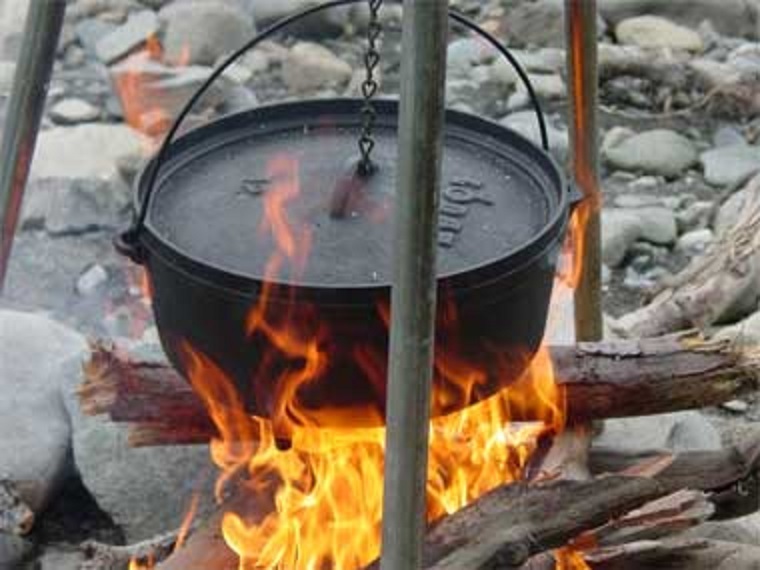 Almost any cooking task can be performed in a Dutch oven. All of my recipes below are cooked on top of the stove but you could easily finish the braising process in the oven. Cover and place the Dutch Oven on the middle of a rack in an oven that has been pre-heated to 300° Fahrenheit and follow the cooking times below. How to Make Dutch Oven Recipes in a Slow Cooker. Converting from a Dutch Oven to a slow cooker is easy. If a recipe has any searing, sauteing or deglazing steps, complete those steps in a pan on the stove top. After adding the liquid, transfer everything to the slow cooker. For recipes that call for either stove top simmering or an oven temperature of 300 degrees F or more, set your slow cooker to HIGH. For recipes under 300 degrees F, use the LOW setting. 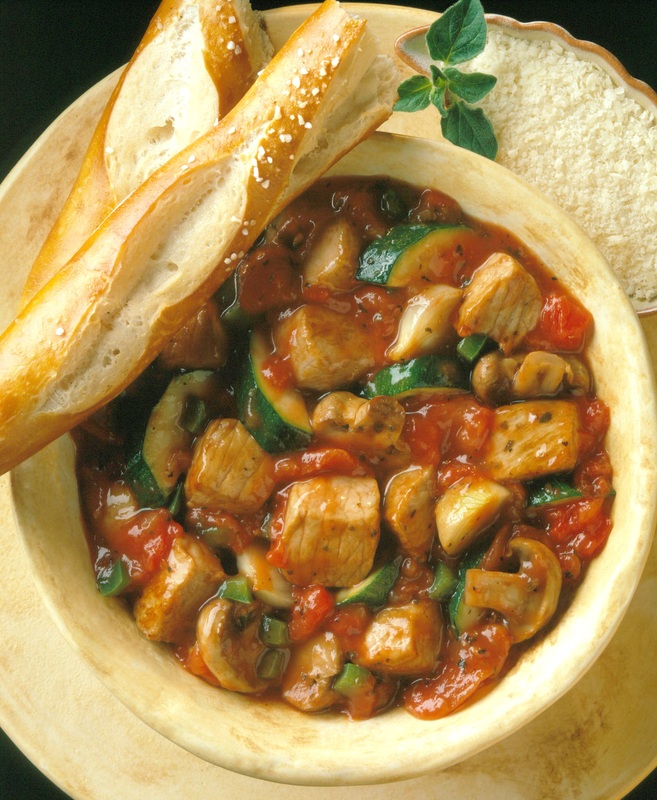 Slow cookers prevent liquid from evaporating, so sauces come out thinner than in a Dutch Oven. Combine flour, salt and pepper in a plastic bag. Add pork pieces and shake to coat. Set aside. Heat 1 tablespoon oil in a Dutch Oven over medium-high heat. Add onion, celery, green pepper and mushrooms. Sauté for 5 minutes, until vegetables are softened. Add garlic and sauté for another 30 seconds. Transfer vegetables to a bowl and set aside. Heat remaining oil over medium-high heat. Sauté pork on all sides, until golden brown, about 5 minutes. Return sautéed vegetables to the pot. Add zucchini, tomatoes and broth and bring to a boil. Reduce heat and simmer 10 minutes, until pork is tender. Stir in basil and oregano, season with salt and pepper and serve. Scatter bread on a rimmed baking sheet in a single layer. Let stand at room temperature to slightly dry out, about 2 hours. Cook greens separately in a large pot (Dutch Oven) of boiling salted water until slightly softened, about 3 minutes per batch. Cool. Squeeze out excess water; roughly chop. Set aside. In the empty pot heat 2 tablespoons oil over medium heat. Add carrots, celery and leek; stir often until softened, 8–10 minutes. Add garlic and red pepper flakes. Cook, stirring until fragrant, about 1 minute. 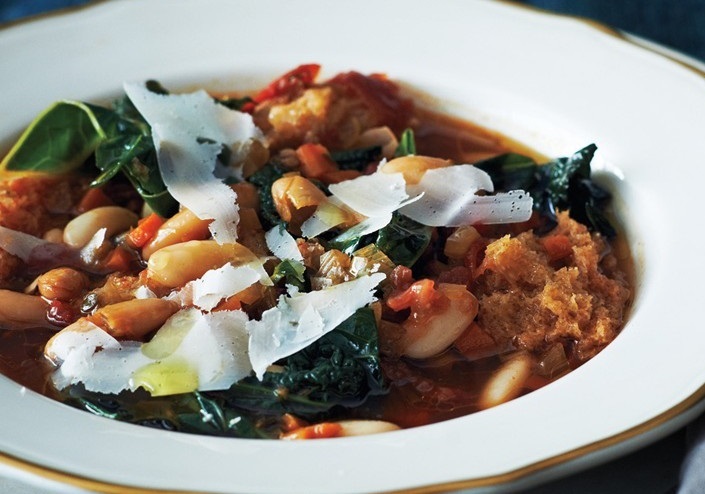 Add tomatoes, broth, beans, thyme, marjoram, bay leaf and reserved greens; season with salt and pepper. Bring to a boil, reduce heat and simmer until flavors meld and soup thickens slightly, 40–50 minutes. Discard herb sprigs and bay leaf. Just before serving, gently stir bread into the soup. Divide among bowls, top with Parmesan and drizzle with oil. 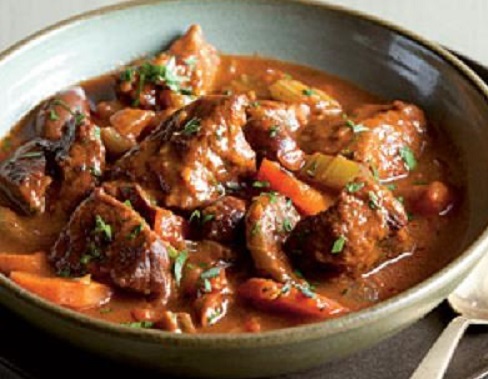 DO AHEAD: Stew can be made 2 days ahead. Let cool slightly; chill until cold. Cover and keep chilled. Reheat before continuing. Store bread airtight at room temperature. Place potatoes in a Dutch Oven, cover with water and bring to a boil over high heat. Reduce heat and simmer until tender, 8-10 minutes. Drain and set aside. Add 1 tablespoon oil onion, garlic and jalapeno to the pan and stir to coat. Reduce heat to medium-low and cook, stirring often, until vegetables soften, about 4- 5 minutes. Increase heat to medium-high, add seasonings, salt and pepper, wine, clam juice and tomatoes; bring to a simmer. Reduce heat to maintain a simmer and cook, stirring often, for 6 to 8 minutes. 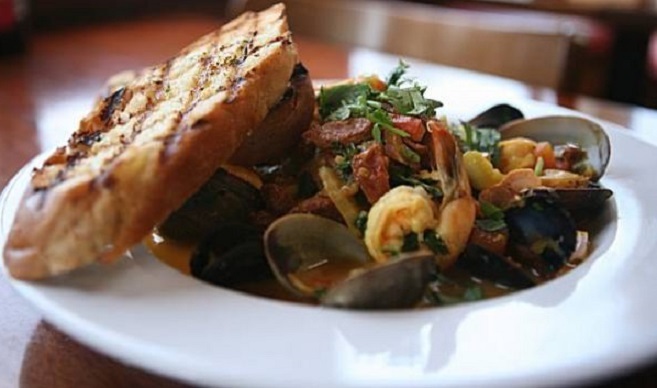 Add the clams and mussels and cook until the shellfish open. Season fish, shrimp and scallops with salt and pepper. Add the fish, shrimp and scallops, cooked potatoes, cream and capers to the pot, return to a simmer and cook until heated through and white fish is cooked, about 2-3 minutes. Garnish with parsley, if desired. Serve with sourdough bread. Heat 1 tablespoon oil in a Dutch Oven. Place 1/4 cup flour in a shallow dish. Sprinkle beef with 1/2 teaspoon salt and pepper and dredge in the flour. Add half the beef to the pan; sauté 6 minutes, browning on all sides. Remove from the pan to a bowl. Repeat procedure with oil and beef. Add the remaining 1 teaspoon oil to the pan. Add onion and chopped carrot; sauté 8 minutes, stirring occasionally. Add garlic; sauté for 45 seconds, stirring constantly. Add wine to the pan and bring to a boil, scraping bottom of the pan (about 5 minutes). Return meat to the pan. Add tomatoes and the next 6 ingredients; bring to a boil. Cover, reduce heat, and simmer for 45 minutes, stirring occasionally. Uncover and stir in sliced carrot. Simmer, uncovered, for 1 hour or until meat is very tender, stirring occasionally. Discard bay leaf. Stir in remaining 1/4 teaspoon salt, basil and parsley. Heat 2 tablespoons oil in a Dutch Oven over medium-high heat. Season chicken with salt; add to the pot and cook, turning once, until browned, about 8 minutes. Transfer to a plate. Reduce heat to low and add garlic and cook, stirring often, until fragrant, 30–60 seconds. Add oregano, tomato paste and red pepper flakes; stir until a smooth paste forms, about 1 minute. Add reserved, browned chicken with any accumulated juices, along with bay leaves and 4 cups water. Scrape up any browned bits. Bring to a boil; reduce heat to medium-low and simmer, uncovered, occasionally stirring, until chicken is tender, about 10-12 minutes. Add chickpeas to the pot; bring to a simmer and cook for 5 minutes. Add diced red peppers. Stir in lemon juice; simmer for 1 minute. Season with salt and more lemon juice, if desired. Divide bread cubes among bowls. Ladle stew over. Garnish with parsley. Lovely recipes and some good conversion ideas. I particularly like your conversion chart Jovina–that will be super helpful since I have a slow cooker but not a dutch oven! Thanks for letting me know Karen. I would love any of those recipes ! 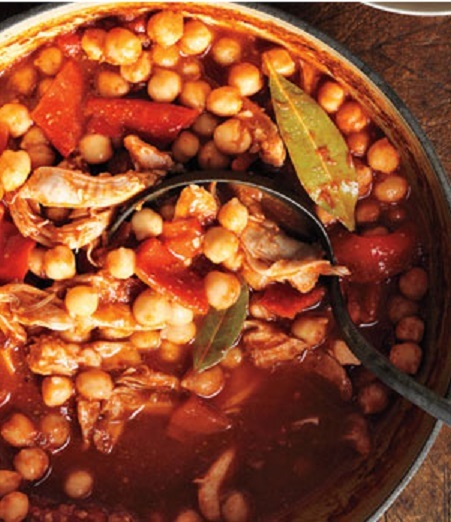 Beautiful pic for the Quick Cooking Pork and Veggie Stew. Looks yummy! I love the conversion chart you added. Wonderful recipes – may be trying a few of them! Thank you Mary. I am glad the recipes appeal to you. Fall is a great time for cooking.